There is no such thing as truly objective reporting, perhaps least of all from ringside of a high-profile, high-stakes prizefight. Various texts adopt various tones and modes when relating what happened in the ring in Jersey City on July 2, 1921. In fact, the pugilistic facts themselves are subject to a wide variety of differing interpretations. Even the fighters, speaking at various moments in their later lives, are liable to provide various accounts. A particularly clear-cut example of this phenomenon is in the spectrum of accounts of the punch that may (or may not) have nearly KO’d Dempsey in the second round of the Carpentier fight. Dempsey can thank his steel jaw for saving the title. He battered the French boy to the floor in one minute and sixteen seconds of the fourth round, after coming as close to defeat as he ever will, perhaps, while the crown of clout rests on his black curls. Carpentier’s lightning shots to the jaw jarred the champion from head to heels. His knees buckled under him for a second or two and it looked as though he would fall. For the first time he backed away and covered up. Carpentier opened the second round wearing a slight smile. Then he went forth and almost won the championship. I will never forget how my heart leapt with the joy of combat when I saw that the great mass in front of me staggered and shaken. For a moment, I was overcome with joy at the thought of victory and the honor it would bring to France. The next second, I realized that I had just experienced the worst possible piece of luck. An acute, shooting pain went through my right hand and I knew that my thumb was broken. My punch made him sag, made him back up to the ropes; but he didn’t go down. It was at that precise instant that I lost the fight. I won just as I thought I would. It was a good fight, and I think the public was satisfied. They say Carpentier staggered me with a right-hand punch in the second round. I don’t even remember having been hit hard enough to shake me up. Perhaps he caught me off balance, and it looked as though I was staggering. When the battle fury comes over Dempsey, he knows but one thing and that is to attack. He becomes so terribly excited that when a round is over it is impossible for him to tell what has happened during that period. All through that second round he carried the fight to me, and toward the close landed one of his best overhand swings on the side of my head. It was a good blow, and he followed it up hard, landing a regular barrage of four or five more blows one after the other. The excitement of the great crowd, with its intense enthusiasm for the Frenchman, brought out such a storm of sound as I had never heard before. To Georges’ thousands of friends and admirers, it seemed that he was winning. I had no such feeling myself and I don’t think Georges had. I knew from experience that I could take even a number of knockdowns and still come through to win. Carpentier’s best blows could do no such damage. He hit me with a real good right in the second. Jimmy Johnston, who saw them all, used to say that Carpentier had the best right hand of all. I don’t know. But it was a hell of a right. It was sneaky, too, and he could deliver it after or during the midst of a lost of those funny springs and lunges that the European fighters go for. It landed high on my left cheekbone. If he had hit me on the chin there’s a good chance he would have knocked me down, and a fair chance he would have knocked me out. This last account of Dempsey’s differs in two ways from the previous ones: first, he accurately says that Carpentier was unable to follow up on the terrific right to the cheekbone, as opposed to the earlier versions in which he erroneously describes a “barrage” of “four or five” more punches; and second, he says here that he was in fact “staggered” by Carpentier’s right, whereas in previous versions he specifically stated that he hadn’t been. One can only speculate as to this change of perspective. It is all the more surprising as the last version, written as the edges of the ex-champion’s memory of his fight with Carpentier were surely somewhat less sharp than they had been, is the one that seems to square best with the objective facts of the bout. Perhaps Dempsey no longer felt that he had to maintain a stance of invulnerability? Perhaps a different ghostwriter, this time his stepdaughter, had different ideas of what would and would not be appropriate or compelling in an account of the fight? Perhaps Dempsey reviewed a film of the fight, thereby causing him to remember things somewhat differently? In any case, even more interesting than this late-in-the-day change of perspective is the fact that Dempsey had in fact already gone on the record admitting that he had been staggered by Carpentier’s second-round right, not long after the fight. Revealingly, he appears to have done so only in French publications, in statements whose existence were never made known to the audience of American boxing aficionados and chroniclers, eager consumers of just such information. Clearly Dempsey, ever astute about image, tailored his account according to the nationality of the eventual readers. The crowd was still roaring. I heard Joe Benjamin yelling at me: “Get him in a clinch, Jack! For the love of God, get him in a clinch! […] Don’t lose the title, Jack! Do you want to go back to being poor? So that’s the story of my fight with Carpentier. I have told it in all sincerity. In New York, they said that I said that I never felt any of Carpentier’s punches. That is absolutely false. Maybe you remember the punch Georges Carpentier landed on me before I knocked him out? Well sir, if that staggering (so to speak) punch had landed a centimeter and a half lower, I would have been the one, not Georges, knocked out! You seem to have a false idea of the worth of the French champion. He is absolutely good enough to get in the ring with me, or with any of the best fighters in the world. Carpentier is an absolutely amazing man. I don’t think you could find a right as awesome as his anywhere in the world. I repeat and I am speaking from experience here: Carpentier is capable of winning against any boxer, me or anyone else, at any time, after the appropriate training, of course. Georges Carpentier gave me the greatest fight of my life. Never did a man come as close to winning the championship as Carpentier did in that glorious second round in Jersey City. And isn’t that proof of a great fighter? No one ever threw a better right, the speed, power and precision of which were amazing… If Carpentier had weighed a few pounds more, I would declare, without the slightest hesitation, that he would have taken his place among the best heavyweights the world has ever known. Even at his weight, I doubt that there was ever a faster, more skilled, more brilliant boxer. I have certainly never seen a more scientific boxer in the heavyweight division and I don’t think there ever was one. No fighter could be more loyal or more chivalrous; he accepted his defeat as only a gallant man can. In fact, I got caught on the jaw with terrific force and I stumbled. I had let myself get caught. I felt my legs buckle; black spots danced before my eyes. The crowd was on its feet, yelling for Carpentier to “finish him off.” My guard was down. It was over! I was against the ropes, bent over. And Carpentier, like a demon, was smashing my chin with rights and lefts. Luckily, I had remained in complete control of my senses. I managed to get away from him and then get him in a clinch. I shook my head, I drew on all the strength I had in me, but I was forced to face up to the pitiful state I was in. I was afraid the title was slipping through my fingers. So that’s the story of my fight with Carpentier. I have told it in all sincerity, just as the events took place. And I would like to kill the idea that I have too often heard bandied about, that Carpentier was like putty in my hands. People have quoted me as saying that I never felt any of Carpentier’s punches during our fight. Never have I uttered such an absurdity. What is most striking here is that a number of the exact same words are attributed to Dempsey by both Bénac and Mortane, both of whom claim to have interviewed him (and no doubt did). Mortane’s book was published in 1926, while Bénac’s did not appear until 1944. On the other hand, Bénac reported on the fight from ringside and did, it appears, talk to Dempsey the very day after the fight. Dempsey may have had a set-piece version of his tale, more or less tailored for French interviewers; if so, he may well have used some of the same words in two different interviews. Even in that case, however, it remains curious that Dempsey’s words, even if identical in English, would have been translated into identical phrases in French. Much more important then the chronology of who said what to whom and who borrowed whose words is the fact that, read together, Mortane and Bénac’s accounts of Dempsey’s narrative of the fight constitute a sort of official French version of the fight. 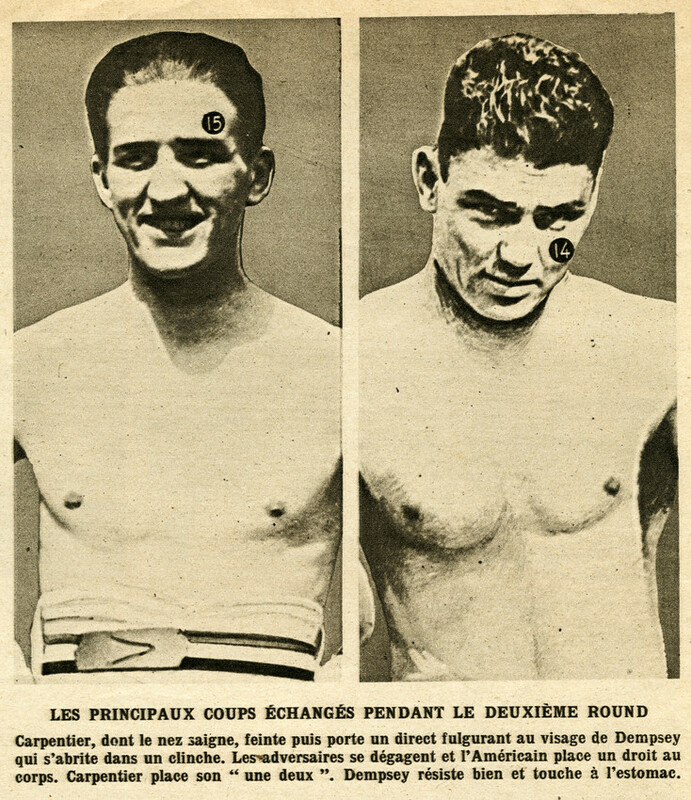 At least as early as 1926, French boxing aficionados were told that Dempsey was KO’d on his feet in Round 2 and that the man himself said so. While many American commentators said this from the start, American fans did not hear it from Dempsey until 1977. Today, Jack Dempsey reveals that mystery. He confided his secret to Carlo Nell, the husband of Franca Duval (the Folies Bergère star), at a gala given in New York by the magician, to benefit former boxers. Dempsey said to him: “In the second round, I was knocked out on my feet, by a right, but no one but me knew it. Carpentier, who hadn’t realized it, made the mistake of not doubling up on his hook: all he would have had to do was push me and I would have gone down. I have to make sure he knows that before I die. Tell him hello for me, because he’s my oldest and dearest friend. In 1970, sitting in Carpentier’s bar on the Place de la Madeleine, Dempsey explained: “In the second round, I was KO’d on my feet, but nobody but me knew it. If Carpentier had so much as pushed me, I would have gone down. Dempsey may well have made, over a period of fifty years, these statements about Carpentier’s abilities and the legendary second round punch in order to please his French interviewers and their readers. He may have wanted above all to flatter Carpentier—the two indeed became fast friends immediately after the bout and remained so for the rest of their lives. There is no way of knowing. What is of interest to historians and biographers is the fact that Dempsey’s versions of Round Two vary significantly, not only over time but according to the nationality of his interlocutor. None of this confusion makes it any easier to arrive at a clear-cut answer to the most fundamental and controversial question surrounding the bout: was it in fact a genuinely competitive contest or was it a grotesque mismatch, carefully crafted so as to bilk as much money out of a gullible public as possible?